Partow waveguide technology is based on thin films of lithium niobate and lithium tantalate that are bonded and transferred to a silicon substrate. A rib layer is loaded on top of the electro-optic thin film layer to form the optical waveguide. 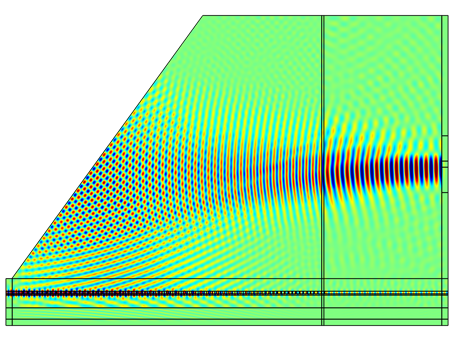 The rib layer is selected from a material with matched refractive index to the slab region in order to make a composite waveguide. The high index contrast waveguide has sub-micron mode size which requires grating couplers for coupling to the device. This high index contrast platform allows to make advanced photonic components such as micro-ring modulators. Partow is developing these devices. It is expected that and packaged prototype optical modulator devices will be available by early 2018 based on this technology. Thin film lithium niobate modulators allow perfect phase matching between RF signal and optical signal. Ultra-wide band optical signal modulation is possible with thin film lithium niobate modulators. The modulators use grating couplers for input and output coupling. The modulator is provided with FC/PC connectors and polarization maintaining fibers. For packaging and fiber attachment to single-mode fibers, Partow fabricates an integrated micro-mirror to couple the light diffracted from the grating to the single-mode fiber. A polymer layer is used that is spin-coated on the device and forms a 45 degree micro-mirror that reflects the light from the grating that is propagating vertically by 90 degrees. 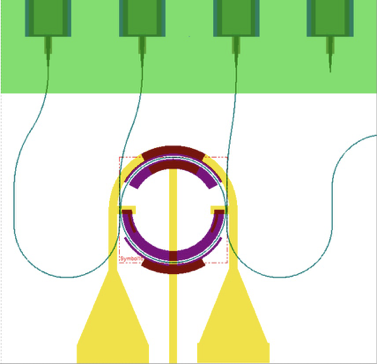 This is done in order to make it propagate parallel to the surface of the chip and couple to a single-mode fiber that can be attached to the chip from one side.